Almost every pet will experience some degree of dental disease in their lifetime! Plaque bacteria thrive in your pet’s mouth (ever smelled that ‘doggy’ or ‘kitty’ breath?). At first they just live on the surfaces of the teeth and gums, but if not removed regularly by brushing or wiping, they will infect the gum tissue, causing inflammation called gingivitis. Gingivitis can be reversed, by thoroughly cleaning above and below the gumline to remove plaque. If nothing is done, bacteria will travel deeper and deeper, infecting and destroying the bone that surrounds the roots of the teeth: this is called periodontal disease. Once that bone has been damaged, it cannot be repaired, and as this painful process continues, teeth will become loose and even eventually fall out. Ouch! Dental health is part of your pet’s overall health – Other health conditions that your pet may have, such as diabetes, feline leukemia or FIV can make your pet more susceptible to gingivitis and periodontal disease. Left untreated, infection around your pet’s teeth can shed bacteria into the bloodstream, which can then cause liver, kidney or heart disease. Chronic infection and inflammation in your pet’s mouth will also take a toll on their immune system. Not to mention chronic toothache will diminish your pet’s quality of life. Just like we care for our own teeth and gums between dentist visits, by brushing, flossing and using mouthwash to remove plaque bacteria and food particles, your pet’s mouth deserves the same care. Our veterinarians and staff can show you how to brush or wipe your pet’s teeth and gums for daily plaque removal. There are also several products that can be helpful, such as sprays, foods and chews. We can help you find products that will be suitable, effective and safe for your pet. Another key part of preventative oral care is having your pet’s mouth examined regularly to detect problems early. This is usually done as a part of a full physical examination, which your pet will be having done at least once yearly. If they will allow it, you should check your pet’s mouth regularly too, and bring any concerns to the veterinarian’s attention. Important Tip: Ask us what type of chews and toys are safe for your pet, to avoid painful tooth fractures. Prophylaxis means prevention. Dental prophylaxis is just that – the next level of preventative maintenance for your pet’s mouth. This is just like when you have your teeth cleaned at the dentist, and involves removal of the buildup of plaque and tartar (hardened plaque) from your pet’s teeth and under the gumline where it counts most. We use an ultrasonic scaler, which is an instrument that breaks up the tartar from the teeth without damaging or scraping the enamel. Polishing follows, to smooth any scratches on the tooth surface where plaque and tartar would more easily build up later. A full oral exam is also done, checking each tooth (just like your dentist does) for problems such as gum disease, growths, fractures, or resorption. By removing the plaque and tartar, gingivitis is treated, and we are able to prevent deeper periodontal disease. 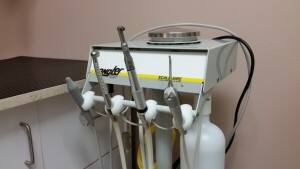 Yearly dental cleaning is ideal. We will inform you when your pet has gingivitis and requires a professional cleaning. Once your pet’s teeth are cleaned, you can start or continue your preventative oral care measures to help keep them as healthy as possible for as long as possible. X-rays are the only way to find out what is happening to your pet’s tooth roots below the gumline, and they can tell a lot. For example, usually a loose tooth is due to periodontal disease, but sometimes there is a root fracture. The decision of what type of treatment your pet’s tooth needs often relies on the x-ray findings. 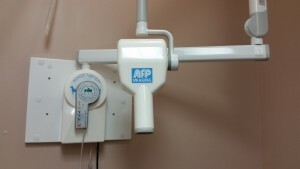 We use a modern dental x-ray machine and small dental x-ray films, to target the area we need to examine and reduce your pet’s radiation exposure. Using a rapid developing system, we are able to perform the x-ray and see the image within just a few minutes, reducing the amount of time your pet is under anesthesia. Unfortunately, it is common for us to find teeth that are beyond repair, and where extraction is the only or best treatment option. Examples of situations where extraction may be necessary include: Severe periodontal disease, fractures and tooth resorption. Extractions are much more involved than ‘pulling a tooth’ – teeth are designed to stay in the jaw against strong chewing forces, so pulling on them will only work if they are about to fall out (like a baby tooth)! Extraction requires stretching and cutting the strong fibrous ligament that attaches the root into the bony socket in the jaw, using special instruments called dental elevators. For multi-rooted teeth (majority of the teeth along the side of your pet’s mouth) it becomes even more involved because they have to be cut into sections so that each root can be removed individually. A flap of gum is moved out of the way, and bone is removed to allow access to the roots, then the tooth is cut into sections using a high-speed drill, and dental elevators are used to cut the root’s attachment until it can be lifted out of the socket. The final steps in any extraction are smoothing out any sharp points of bone, cleaning and flushing the socket, and stitching the gums closed. Medication for pain relief will be administered and usually there will be a prescription sent home as well. Antibiotics may or may not be required. Usually soft or softened food is necessary for 1-2 weeks after extractions, mainly to prevent damage to the areas where gums have been stitched. Your pet will feel so much better after painful teeth have been removed from their mouth! Even the calmest, most easy going cat or dog won’t hold their mouth open and allow the veterinarian to probe around each tooth in an awake and conscious state – Let alone allowing for a full cleaning which can take 30-45 minutes! This is why anesthesia is required – for your pet’s safety and comfort, they need to be absolutely still while we do a thorough examination of their teeth and mouth, scale and polish teeth, and perform dental x-rays, and it goes without saying that extractions, lump removals and other procedures require anesthesia. Don’t worry – modern anesthetics are quite safe, and we do everything possible to further reduce the risk to your pet! Your pet will be evaluated prior to the procedure (usually with a thorough physical examination and bloodwork, urine testing or other testing as required) to assess their anesthetic risk level. Our veterinarians will tailor the sedation, anesthetic and pain medication specifically for your pet, to ensure the safest and best outcome for him or her. Your pet will receive IV fluids, external warming, and be monitored closely during and after their procedure. Of course, it is natural to worry when a loved one is going to have a general anesthetic, but rest assured that your pet’s safety and comfort is a priority for us, just like if they were one of our own pets.